"a notary can not complete an I9 form". I-9 Employment Eligibility Verification Service will be provided as a Designated Authorized Representative for the Employer. Please call us at 210-630-0406 to get our Authorized Representative agreement. Services will commence after receiving the agreement contract from the Employer. The employer would have to submit the agreement to us before any services would be rendered. These services are Non-Notary Services and will be performed by non-notaries. Submission of form does not constitute acceptance of job assignment. 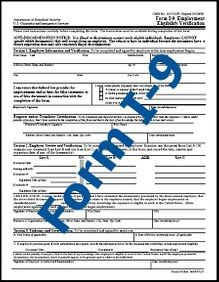 What is a Form I9? The Employment Eligibility Verification Form I-9 is a U.S. Citizenship and Immigration Services form. It is used by an employer to verify an employee's identity and to establish that the worker is eligible to accept employment in the United States.